Rookie QBs: Are They Better Off Starting Or Sitting? Our pal Scott Enyeart made a point on our recent podcast that Pete Carroll may be making this quarterback decision with an eye on 2013. The reasoning would be that if Russell Wilson is the designated “franchise quarterback,” he might be better off starting this year and taking his lumps in order to make a massive leap in year two and vault the Seahawks into Super Bowl contention. To that end, I did some research looking into how the best second-year quarterbacks in the history of the NFL to see how many of them were starters as rookies. The quarterbacks highlighted in blue started at least ten games in their rookie seasons. Some others played a few games as rookies, but did not start out the season as the designated starter. It should also be noted that this only includes second-year quarterbacks that started at least 10 games in their second year. One of the first things I noticed was how few quarterbacks had great passer ratings in their second year. Only 18 players in the history of pro football have had a passer rating over 85.0 in their second season. The other interesting factor here is the age of some of these “second-year” players. Seven of the thirty were 26-years-old, or older, when they played their second year in the league. 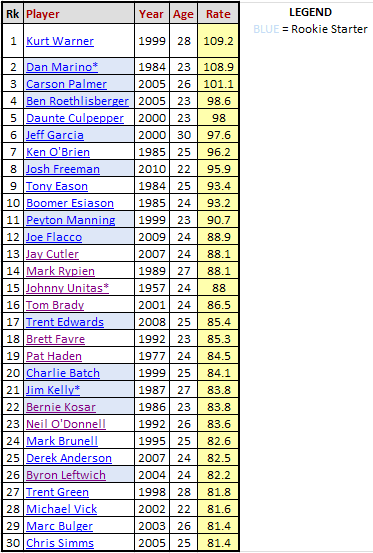 To Scott’s question, only 12 of the top 30 second-year quarterbacks started at least ten games as rookies. Again, that does not mean they never played a snap. Some even played meaningful snaps (e.g., Jay Cutler started five games and played very well). The question, though, is whether history suggests quarterbacks are better off learning on the field their first season or observing. This data indicates teams have better odds of getting great production from their young quarterbacks if they allow them to at least begin their first season on the sidelines. There is another way to interpret these results. Seven of the top eleven second-year quarterbacks did start as rookies. One could make the argument the highest possible passer ratings for second-year players come from guys who learned on the field as rookies. Out of those 20 players, seven started at least 10 games as rookies. Three of the top ten started at least 10 games as rookies. Again, evidence suggests most of the best quarterbacks in the game did not start out as starters their rookie seasons. Does this mean Wilson is doomed to mediocrity if he starts? Of course not. He has already proven to be an outlier to those that said 5’10” quarterbacks can’t play pro football. Everyone that watches him can tell he is special. The key question I keep coming back to is whether the best thing for him and this franchise is for him to start or for him to learn more on the sidelines. Very few, if any, teams that started rookie quarterbacks had a player like Matt Flynn as an alternative. The Seahawks are not deciding between forcing a rookie into the lineup or suffering with a terrible veteran. This is why Carroll and John Schneider get paid the big bucks. It is one thing to defy convention. It is another thing to bet against history.